My friend Sky calls me occasionally to go ski in Canada. I'm usually apprehensive. This time, that wasn't necessary. After a long drive, a stay at Alex's parents vacation home in Whistler, we were off to the Wendy Thompson Hut. AMAR hiking through the woods up to the Wendy Thompson Hut. I thought I had brought enough clothes for the trip, but we all agreed by its end that we needed more. Not only a massive puffy and mittens, but face masks as well. 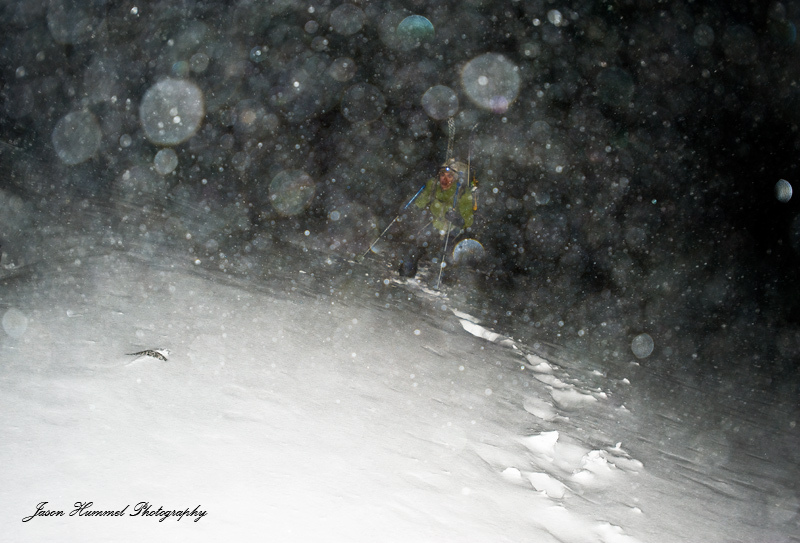 After an easy day in, nice touring on good snow, a storm came in with what appeared to be MORE good snow. WE were stoked. Then the wind came and huffed and huffed until everything was buffeted to windboard. But - that snow had to have gone somewhere? After going to bed, all of us were woken in the middle of the night by a massive crashing sound that shook the entire structure! 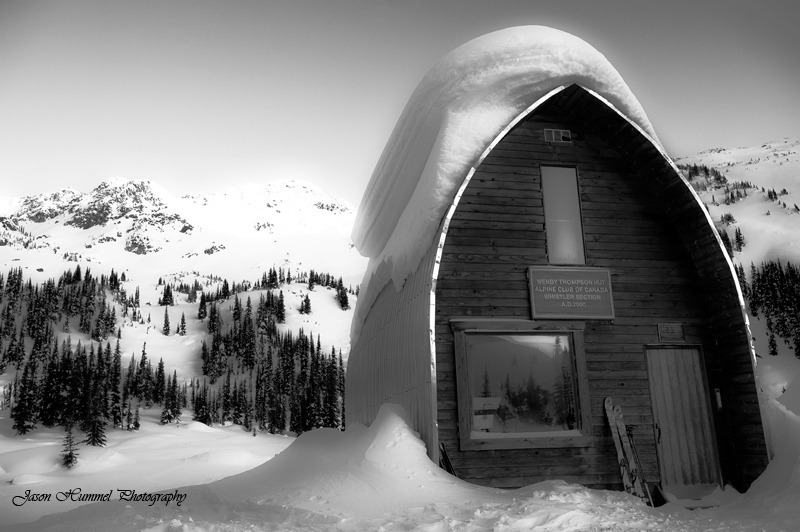 Turns out the cornice on top of the hut had grown so large, it had reached critical mass and broke off. I guess that's where some of the snow went, eh? That is before escaping the Coast Range altogether. 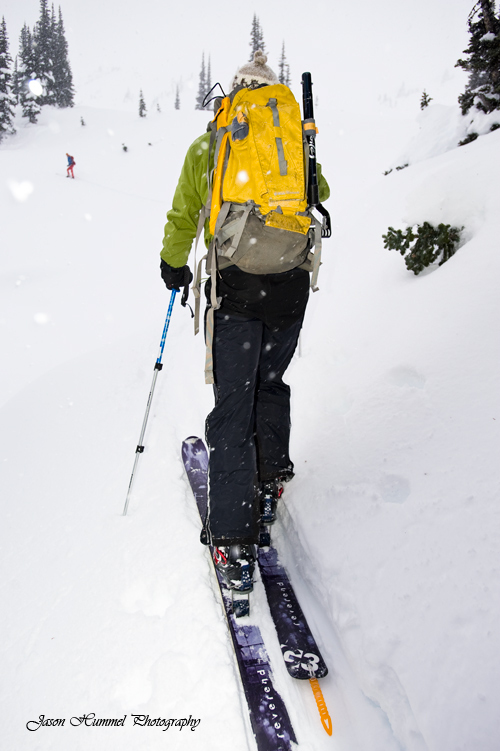 ALEX skinning up from the cabin for some turns. 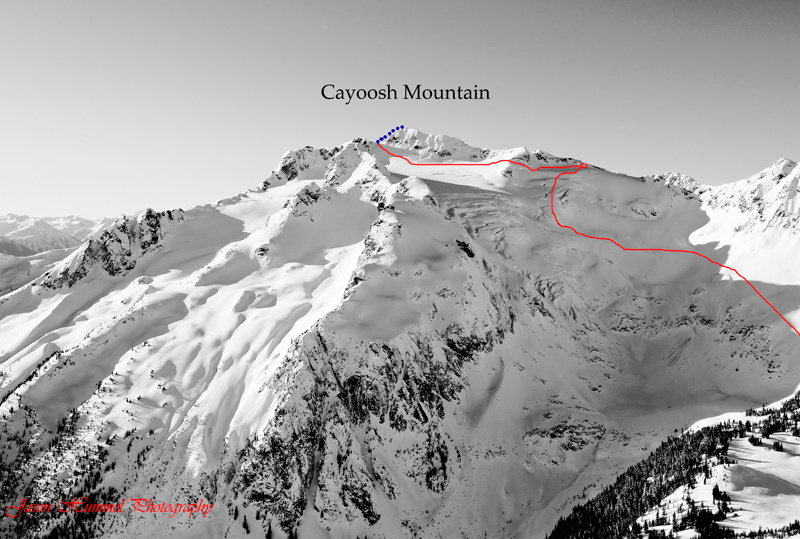 The next day it was decided that we would climb Cayoosh, one of the larger peaks in the area. Between the hut and the peak itself is a pass. This was gained early in the morning and was where Amar decided that the wind and cold were too much for him. Not so studious and less wise, we continued on, happy that the sun had come out and perhaps warmer temps were just around the corner. This was not to be. The climb up the glacier was began by traversing beneath a wonderfully distracting ski line that was unfortunately wind plastered and full of hard slabs. Continuing we came close to several crevasses whose December snow coverage was less than appealing, so we sought the ridge and its relative safety. Little did we know, that the aforementioned wind was so ferocious! Crossing to what we thought would be a good resting place instead morphed into an ill-advised crossing into the face of a wind-powered sand-blaster! 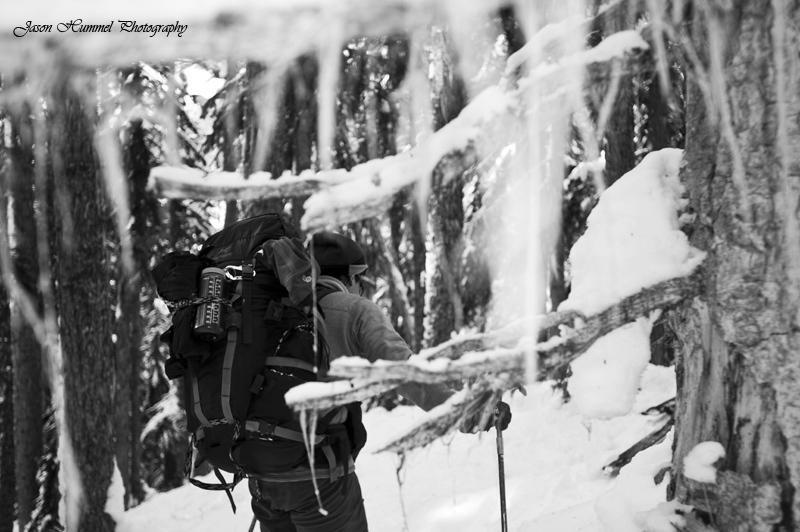 I stumbled and crawled with my hands over my face back to where we had been, on the other side of the ridge. The gusts were powerful. Sky's nose froze a bit and I felt like my face had been ripped off. We won't be doing that again. 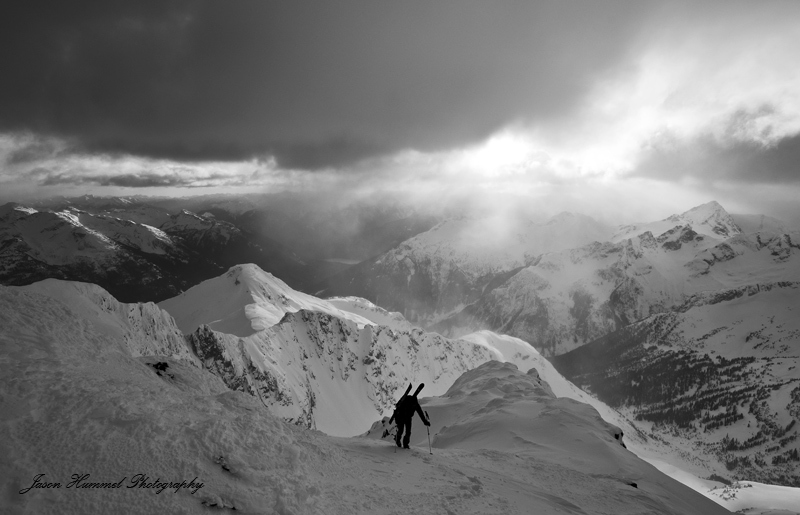 Sky skinning up Cayoosh Mountains Glacier. You can see the summit, right of center. We instead traversed along the ridge, finding easy going on skins all the way over a few small passes, before arriving at another that brought us around to the backside of the peak. It was here that light flooded through clouds onto wind buffeted ridges where it spun snow out into sky, coloring it pink. It was something of a sight! Making Sky and I's wait for Alex inconsequential, especially since we had finally found a place the wind ignored. The clouds were wild, blowing in all directions. 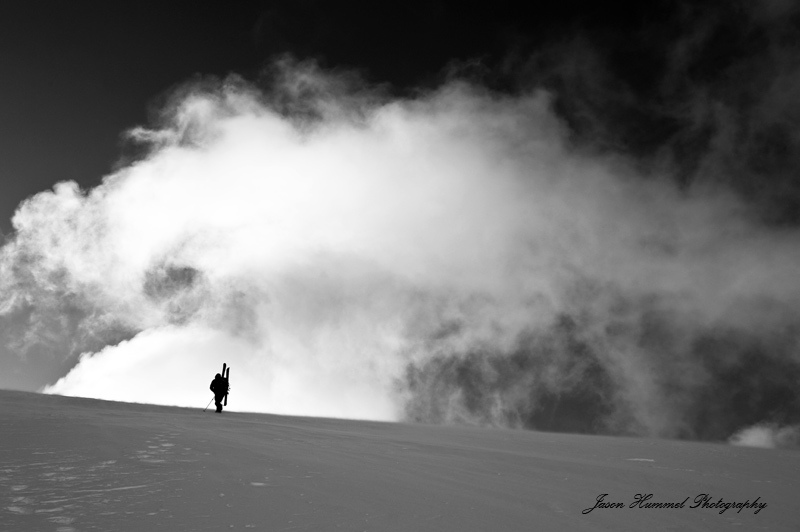 A rime-surrounded couloir packed in hard, smooth snow led us to the final few feet, which I climbed, feeling my efforts could in no way make up for Sky's full-day lead, but nevertheless, I snapped a photo of the hero himself. I'm sure he's already gotten over it. We finally made the back side of the peak, just as the weather was coming in. I'm near the summit, looking down at Sky. You can see some of the snow that was blowing. 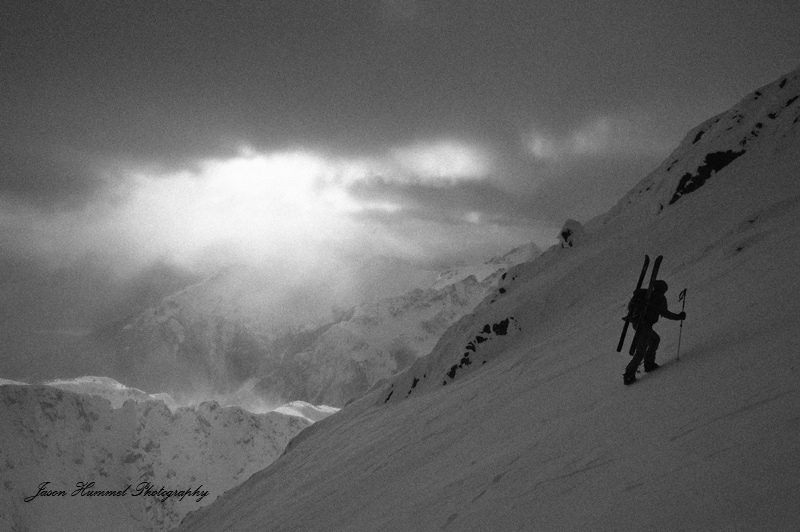 The way back was on sastrugi and windboard. Suffice it to say, the skiing sucked, but the climb was fantastic! 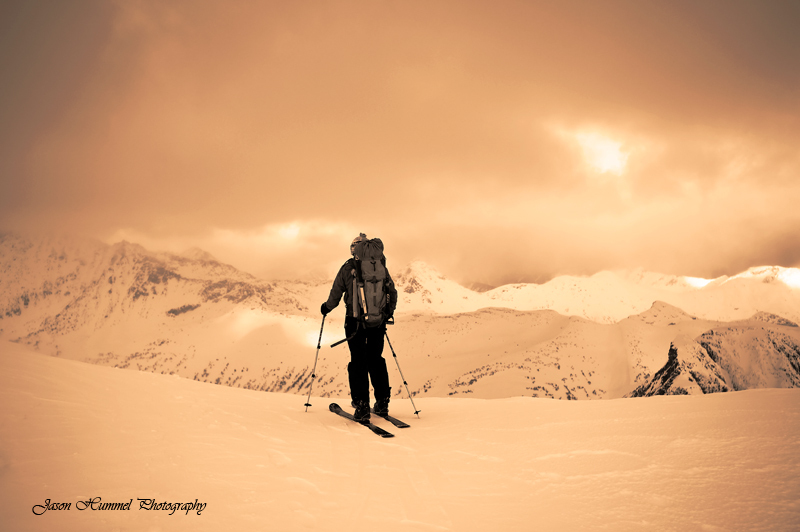 To see new mountains is a thrill that can't be ignored and neither could the fading light. Darkness was fast approaching, as early winter days are very short, so we rushed down to the lakes far below. By then, dusk had come, and so, leaving before the others, I led the way back up to the pass where we had earlier crossed. To make my climb more rewarding, wind made its thundering return, slowing me down each time I had to wait it out. Since my skins were having trouble biting into the windboard my progress was slowed down even further. Without goggles (cause it was dark out) I'd close my eyes and wait for the wind to stop, then move up as far as I could before waiting once more. About 100-ft from the top, I postholed the remaining distance to the top and waited for the others. Alex resting after a short climb back to the col before dropping down to the glacier. I managed a night shot of Alex. The price was the same as it had been all day, aching fingers. By that point my very expensive camera was nearly a lump of ice. Encrusted in every crevasse was snow. What excited me was that it still worked perfectly and to say that the Standard Operating Temperature is only 32-104°F/0-40°C is laughable. But so be it, I'm happy to smirk. Standards are made to be broken, right? Stormy weather and darkness are not a good mix, but we made the best of it! The final ski down was on awesome snow. I don't know where it went the next morning, but that night it was a white carpet of joy that carried us all the way to the final shuffle to the Cabin. What a day! Inside another 6 people had showed up. 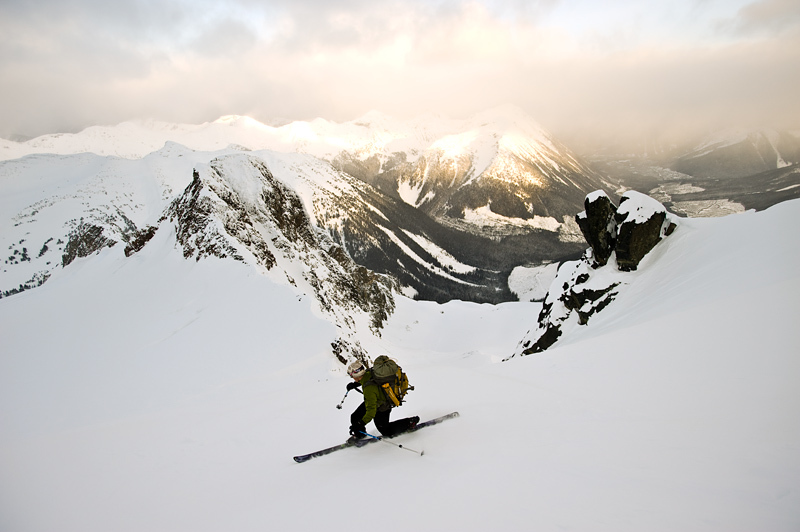 It turns out one of them was John Baldwin, who wrote 'Exploring the Coast Range on Skis'. The next and final day was spent lapping terrible snow. By late afternoon, we returned to clean up the hut and head back to the cars. We managed the return by shuffling all the way, without having to resort to skinning. All in all, this was another great weekend in Canada. I'm really beginning to enjoy these occasional raids across the border. Expect many more to come!!! 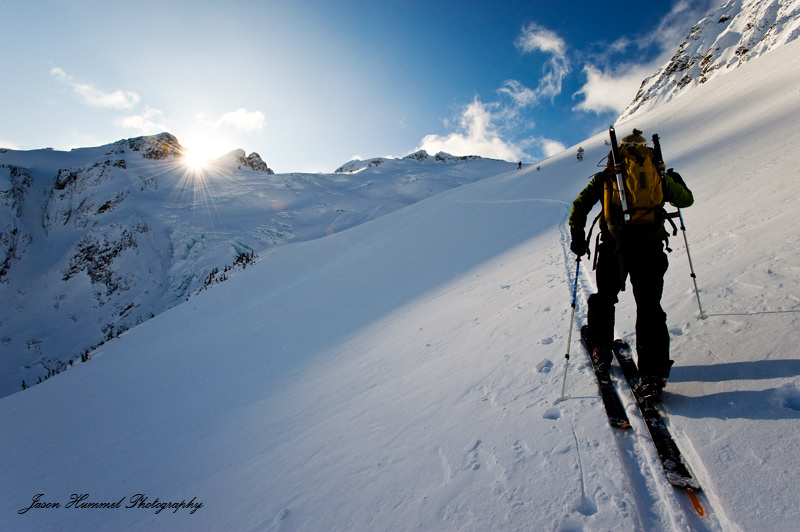 Other so-called raids: Castle Towers and Garibaldi Traverse. 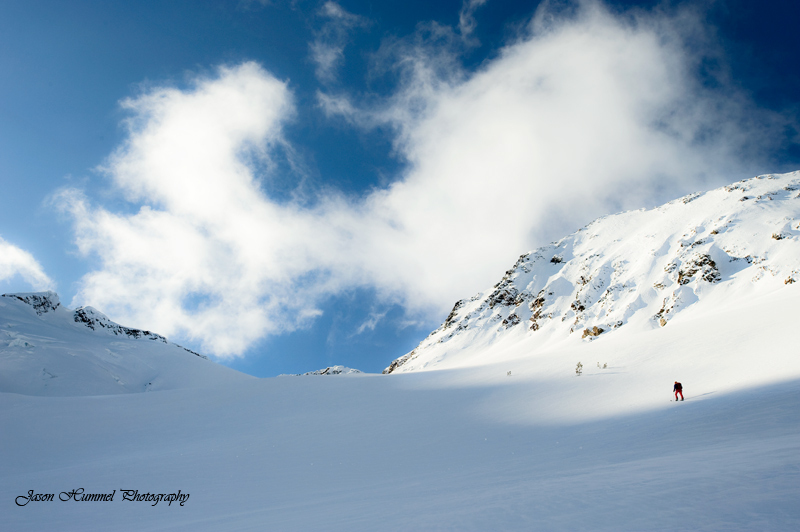 To see my pictures in FULL size or to purchase or license, please go to Alpine State Of Mind. To see the gallery for this trip, go HERE.